Don’t you just love recipes that remind you of your childhood, they just have a special place in your heart. 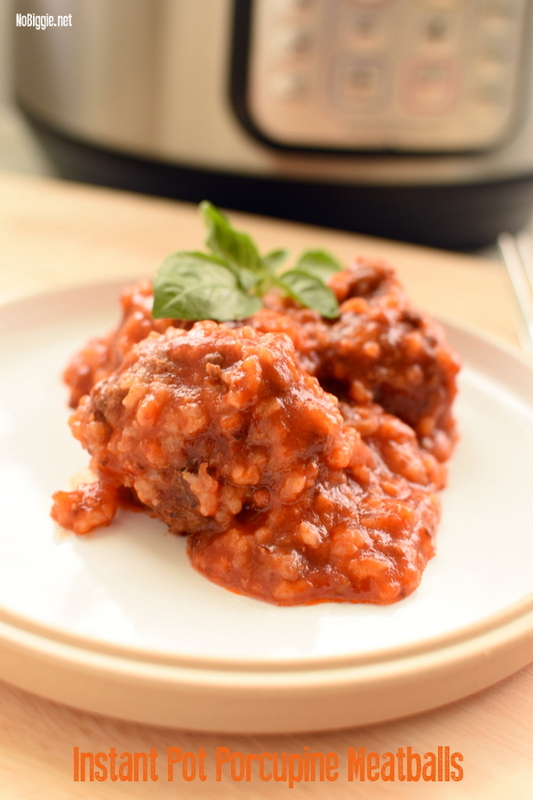 Porcupine meatballs is one of those recipes that makes me feel all nostalgic. The name porcupine comes from the rice that’s added into the meatballs before they cook, which makes them look like little porcupines. This is such an easy recipe, and now even easier in the instant pot (pressure cooker). 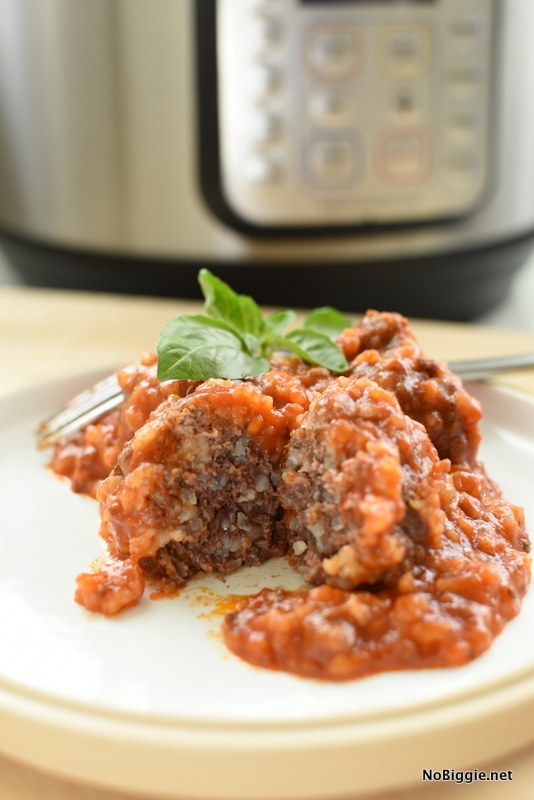 Instant Pot Porcupine Meatballs is one to add to your weekly menu for sure! 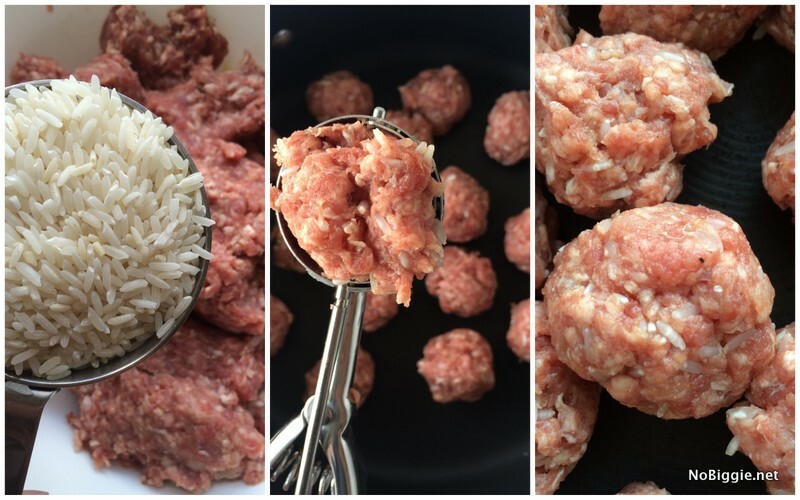 One half cup of uncooked white rice mixed into the meatballs gives these meatballs their name. The tomato soup gives it a delicious sauce and so much flavor. Did you know it’s super easy to make your own homemade tomato soup? There was a short time our family was on an elimination diet, and I needed to make a homemade version of tomato soup, and I was thrilled to learn it is so easy! When you make this recipe using a pressure cooker, or instant pot, you can cut the cook time by 20+ minutes. 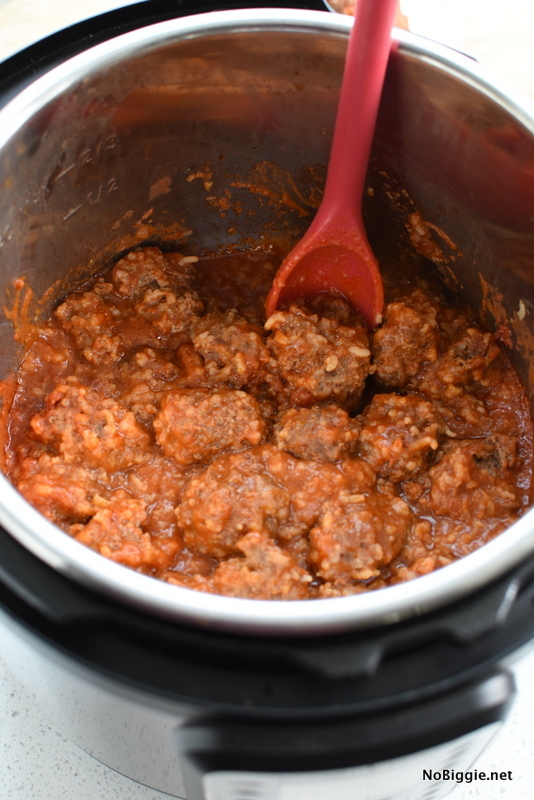 It’s fun to use the sauté feature in the Instant Pot to brown the meatballs, and then add the soup mix and set your instant pot to pressure cook! Do you have a stainless steel scoop like this? It’s made for ice cream, but I rarely use it for ice cream. I actually have a different favorite scoop for ice cream. This stainless steel scoop is great for making uniform looking meatballs…cookies…you name it! Once your meatballs are all rolled up, they’re ready to brown. You can use canned tomato soup or you can make your own! I love to make my own, because you can avoid ingredients like high fructose corn syrup. A family favorite recipe made even quicker in the Instant Pot! For homemade tomato soup, blend ingredients together in your blender. Mix together the ground beef, rice, egg, minced onion, salt and pepper. Form the mixture into meatballs (with an ice cream scoop if you'd like). Brown the meatballs in a skillet on medium high until all browned. Drain off the excess fat. Add in the tomato soup with water and simmer the meatballs for one hour until the rice is cooked. Serve warm with a vegetable on the side. Add the uncooked prepared meatballs into the instant pot and brown the meatballs with the sauté feature until they are mostly browned on all sides. 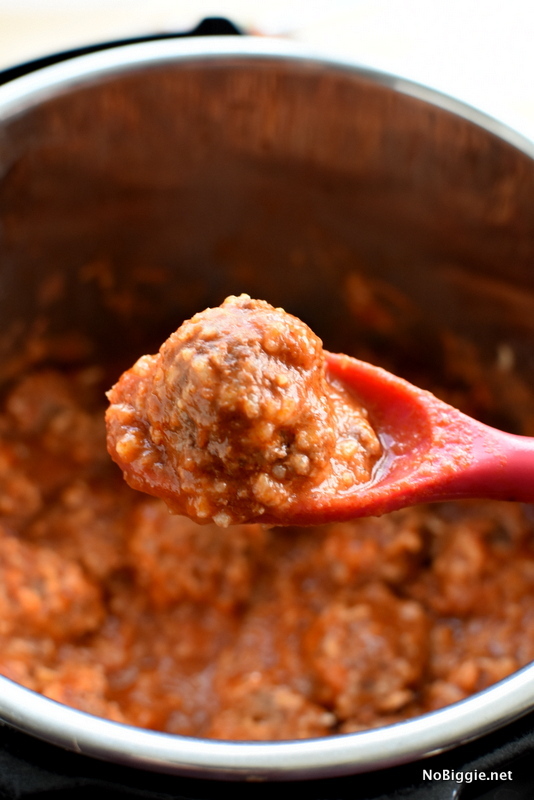 Add in the sauce and stir to coat all the meatballs in the tomato soup sauce. Place the lid onto the Instant Pot. Set the steam release valve to "seal". Press the button for "pressure cook" and set it to 25 minutes. The Instant Pot will take a few minutes to build pressure inside before the timer count down begins. After the 25 minute cook time, let the Instant Pot naturally release pressure for another 15 minutes. Slowly remove the lid and serve warm. Enjoy! We like extra sauce for these meatballs, so we like to add in extra soup. There are no rules on this one. 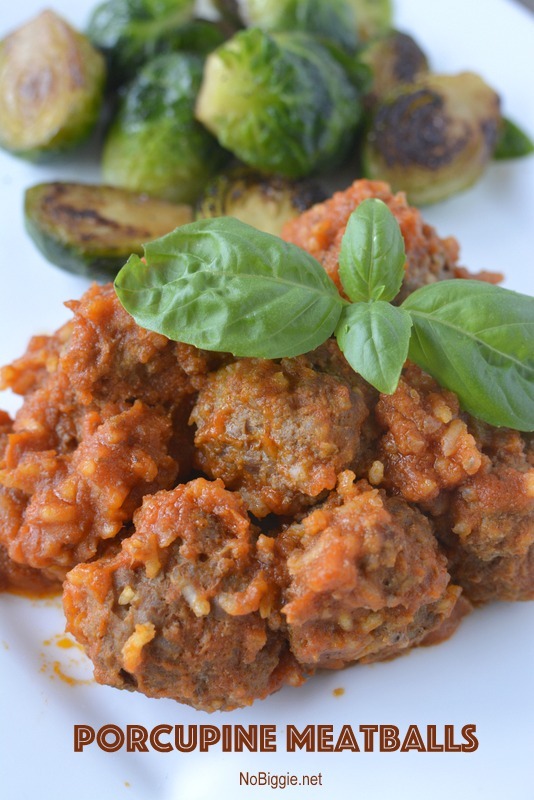 These meatballs go great with garlic bread, a side salad or a vegetable side dish. That’s it! You’ll have to make it, my family loves porcupine meatballs!! 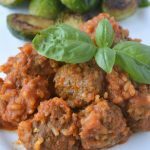 What to serve with Instant Pot Porcupine Meatballs? We use Minute Rice in our PP meatballs. Have been making them for years. Yummy! Interesting, I’ve never heard of these before! Will have to give them a try! They’re so good! Easy dinner too! I have always used pre-cooked rice. Cuts the cook time way down, and works fine.